Snow and freezing temperatures could return to parts of the UK in time for Easter if the “Beast from the East” strikes for a third time. The Met Office said snow could fall in Scotland and the east coast of England as cold air envelops the country from the middle of next week. A distinct drop in temperatures can already be felt. Increasingly unsettled conditions are expected later on Wednesday and Thursday as a frontal system from the west brings a spell of heavy rain followed by lower temperatures. 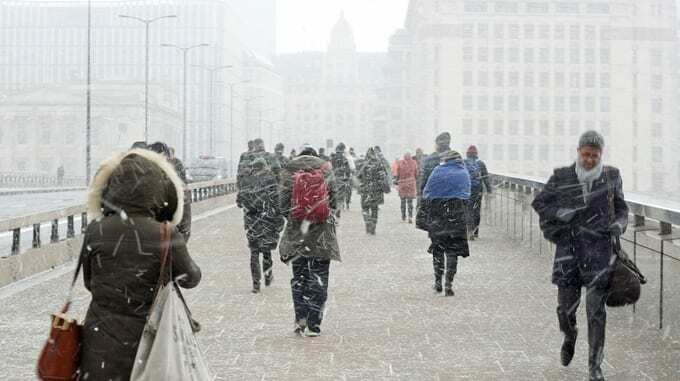 Business analysts have said that the extreme weather conditions in February and March, hit the economic growth for the first three months of the year because of disruption to transport which meant lost work days and fewer people shopping. Forecasters said that snow is expected only in some parts of higher ground in the north. The return of the extraordinary spell of extreme cold and disruptive weather that paralysed transport links across the UK last month have many people concerned. But forecasters have reassured commuters and WTX News readers that although the climate is currently coming in from the east, the impact should be significantly less than it was a few weeks ago. Outbreaks of rain, perhaps with some hill snow, will move east across southern Britain today. Elsewhere, it will be drier and brighter with scattered heavy and thundery showers developing. Cloud will clear from eastern Britain, leaving much of the country dry and cold with clear periods and some mist or fog developing. Cloud and showery rain will push into south-west Britain later.